Big data analytics is the process, it is used to examine the varied and large amount of data sets that to uncover unknown correlations, hidden patterns, market trends, customer preferences and most of the useful information which makes and help organizations to take business decisions based on more information from Big data analysis. In today’s era, implementation of Big Data Analytics in many companies made life very easier. It is possible to process data very quickly and efficiently. That includes analyzing the data and make use of the result. This makes a lesser effort and more efficient where it is not possible with more traditional business intelligence solutions. There are different types of tools are available under the Data Analytics which helps to improve the data analysing the process that are data analysis, data cleansing, data mining, data visualization, data integration, data storage, and its management. Big Data Analytics tools are very important for enterprises and large scale industries because of the huge volume of Data will be generated and managed by modern organizational tools using Bigdata tools. Big Data Analytics tools help businesses in saving time and money and also in gaining insights to make data-driven decisions. Big Data analytics is the complete process of collecting, gathering, organizing and analyzing the huge sets of data (known as Big Data) to observe/identify the patterns and also other useful information needed for business decisions. The process – Big Data analytics helps organizations for better understand the information which is present within the sets of data. The guy who works as Analysts working with Big Data typically will have the knowledge that comes from analyzing the data. For the process of big data analytics, there is a need for very High-Performance Analytics. Hence to analyze such a huge volume of data, specialized software tools required for Big Data analytics process and applications for predictive analytics, data mining, text mining, forecasting, and data optimization. There are many advantages to using Big Data Analytics. This process of big data analytics with high-performance in predictive analytics, data mining, text mining, forecasting that data, and optimization helps the enterprises in getting benefit in many areas which includes new revenue opportunities in business, for more effective marketing of the products, in providing much better customer service, in improving operational efficiency and also can make decisions on competitive advantages over market competitors. To be Specific on Big Data Analytics process, it enables enterprises to breakdown/narrow their huge volume of data to the most relevant information and analyzes it to inform critical business decisions. This proactive approach to business is transformative because it gives analysts and decision makers the power to move ahead with the best knowledge and insights available, often in real time. 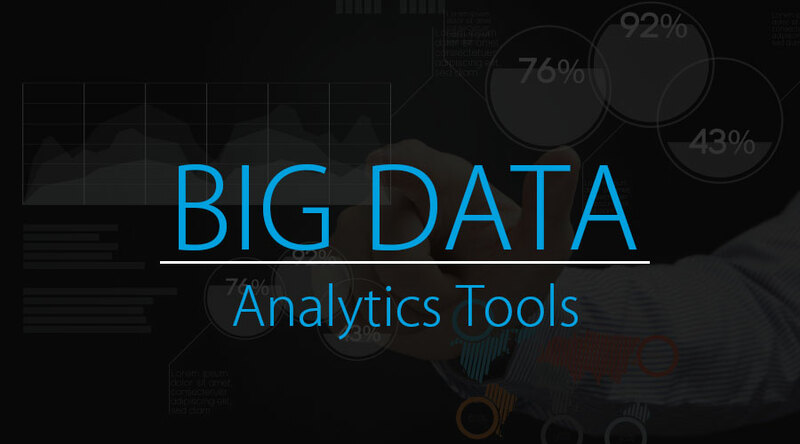 There ‘N’ number of Big Data Analytics tools, below is the list of some of the top tools used to store and analyze Big Data. These Big Data Analytics tools can be further be classified into two Storage and Querying/Analysis. Apache Hadoop, a big data Analytics tool which is a java based free software framework. It helps in effective storage of huge amount of data in a storage place known as a cluster. The special feature of this framework is it runs in parallel on a cluster and also has an ability to process huge data across all nodes in it. There is a storage system in Hadoop popularly known as Hadoop Distributed File System (HDFS), which helps to splits the large volume of data and distribute across many nodes present in a cluster. It also performs the replication process of data in a cluster hence providing high availability and recovery from the failure – which increases the fault tolerance. KNIME Analytics Platform is one of the leading open solutions for data-driven innovation. This tool helps in discovering the potential & hidden in a huge volume of data, it also performs mine for fresh insights, or predicts the new futures. The KNIME Analytics Platform tool is very much helpful toolbox for data scientists. OpenRefine is introduced as Google Refine. This tool is one of the efficient tools to work on the messy and large volume of data, that all includes: cleansing data, transforming that data from one format another, and also to perform extending it with web services and external data. The open refine tool helps explore large data sets easily. Orange is famous open source data visualization and helps in data analysis for beginner and as well to expert. This tool provides interactive workflows with a large toolbox option to create the same which helps in analysis and visualize of data. An orange tool has many and different visualizations, that include bar charts, trees, scatter plots, to dendrograms, networks and heat maps. RapidMiner tool operates using visual programming and also it is much capable of manipulating, analyzing and modeling the data. RapidMiner tools make data science teams easier and productive by using an open source platform for all their jobs like machine learning, data prep, and model deployment. Because of its uniformity in data science platform makes accelerates in a building of complete analytical workflows in a single environment which helps in dramatically improving efficiency and short duration of time to value for data science projects. In travel and hospitality business, it is very important and key factor to keep customers happy, but to make customer satisfy is harder to gauge. For example, in Resorts and casinos, they will be having a very short span of opportunity to turn around a customer experience. Hence applications of Big data analytics gives the ability to collect customer data, apply statistical analytics to better understand and improve these businesses. Nowadays, customer service has emerged as a huge tree compared to past decades, knowledgeable shoppers always keep searching and expect retailers to understand exactly what they want and when those products need it. Here Big data analytics technology comes into the picture and helps the retailers meet customer demands. There are few and particular government agencies always face some big challenge like how to prepare the budget for the public without any compromise on quality or productivity. Hence many agencies use big data analytics; which helps them in streamlining operations while giving the agency a more correct view of criminal activity to avoid preparing a feasible and good budget. Big data analytics can also be used in the healthcare industry. Maintaining the Patient records, their insurance information and health plans and also all other types of information which are difficult to manage. Hence it is so important applications of big data analytics technology in the healthcare industry. In the current situation, the volume of data is growing along with world population growth and technology growth. This is a clear sign/indication of increasingly widespread use and necessity of Big Data Analysis solutions. Big Data is not just a trend of technology but it is a business practice which helps the industries/enterprise to stay in this competitive world to make their proactive data-driven business decisions on to improve sales and marketing team performance, increase revenue.